Experimenting with Things that Smell. “I want to do sperimenting” Noah said one afternoon. “You want to do what? ?” I asked, not understanding his unusual four year old pronunciation. 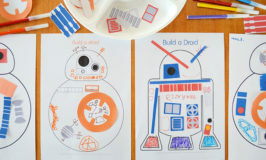 I love it when my kids create spin off ideas from activities we’ve done, so I was all four another round of ‘sperimenting’. And so we spent the afternoon making potions and experimenting with things that smell! The first thing we needed was to collect some things that smell, so I asked Noah if he could think of anything that smelled. He immediately thought of flowers so off we went to the garden to collect some flower petals. 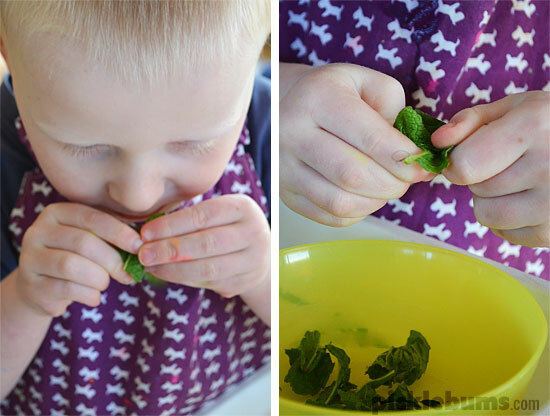 While we were out there I picked some mint and asked him to smell the leaves, and so we added some mint leaves to our collection. “It smells when Dad mows the gwass, can we have some gwass too? Noah asked so I snipped some of the looooong green grass and added that to a section of the cutlery tray. Back inside we talked about more things that smell… perfume smells, farts smell (and yes we had a long conversation about how we could catch fart smell) and food smells. I went with the food suggestion and added some vanilla essence and lemon essence to some water with a few drops of food colouring just for fun. We put some white vinegar in another container, because that definitely smells, and got out some bicarb too… because you can’t have an experiment without fizzing! 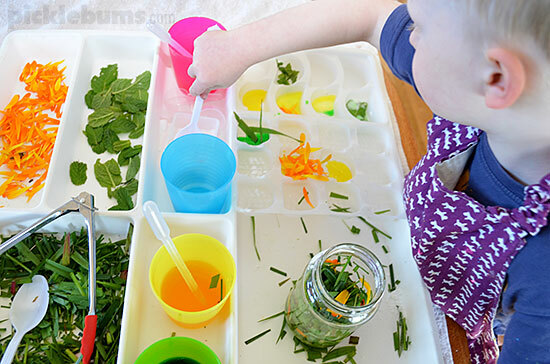 Some spoon, scoops, tongs and droppers added a variety of fine motor skills to our experiment, and a selection of plastic trays, containers, and a couple of jars were perfect for mixing and making potions. 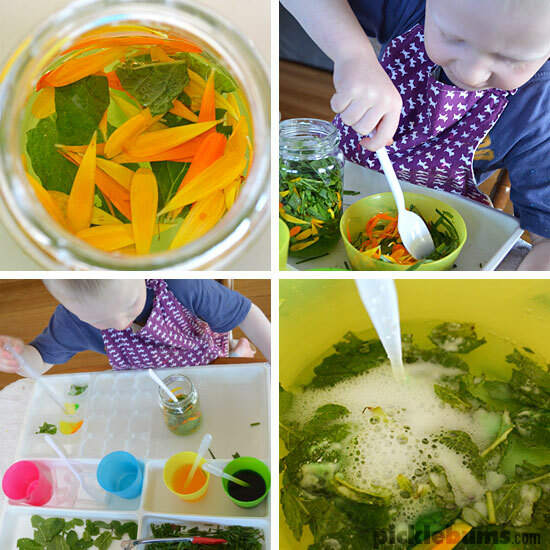 Noah had lots of fun crushing petals and leaves and smelling the aroma they released, sniffing deeply the yummy vanilla and lemon scents, and wrinkling his nose at the strong vinegar smell. We had lots of fun mixing the ingredients and their smells together to make magic potions or perfume or soup or poison. 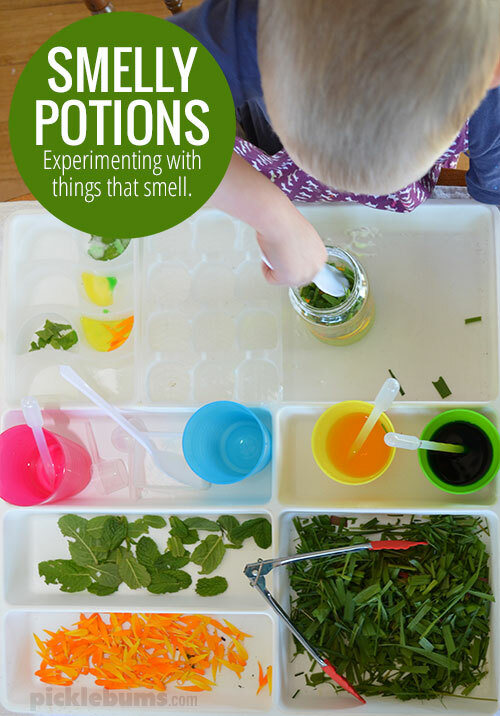 Noah ‘sperimented’ for a long time, and I spent a long time sampling his potions and perfumes and passing judgement on whether they were good, bad or deadly..
Do your kids like to ‘speriment’ too? 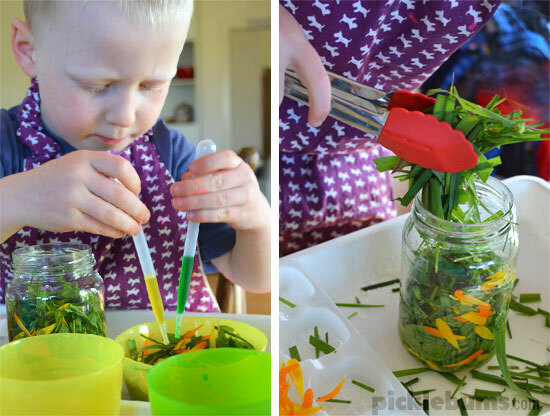 We make experiments all the time!! They, too, usually involve food coloring, but sometimes I’ll get out the spices and we’ll have smell experiments too. 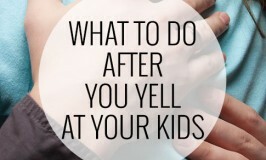 My kids will each make their own “scent” and them we’ll have a smell off. The last scents were so good, I kept them in their little pots and I’m planning to use them to season a chicken…. ha ha ha ha!!! I Love it! Especially the child-led learning like that. My Little rarely does that, enjoy it! We do this sperimenting about two saturdays a month. We empty the old spices, plastics cupboard, last of the baking powders etc…I also Almost jussst threw out a Huge tray i have that looks the same as that white one you have here–am i ever glad i saw this post! You just gave it new life! We have used the big cutlery tray for so many things… definitely something to hold on to! Home » Experimenting with Things that Smell.